September 12, 2016—-The World Solar Challenge (worldsolarchallenge.org) is a solar car race that takes place in Australia every two years. Teams from universities, corporations and even high schools from around the world participate to promote research on solar-powered cars. The solar car race began in 1987 and in 2015 there were 43 teams from 23 different countries entering the race. The 30th anniversary of the race will be October 8-15, 2017. The idea for the contest came from Hans Tholstrup who was the first to navigate a solar car coast to coast across a country–Australia. 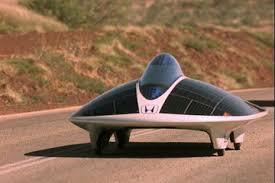 In 1982 Hans Tholstrup, along with Larry Perkins, drove their solar car across Australia in 20 days. (See article, “The First solar Car to Cross a Continent”, Planet Earth Weekly, August 24, 2016.) 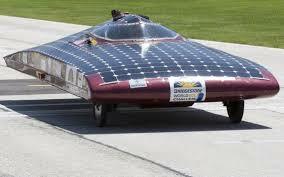 The contestants in the World Solar Race are allowed 5kw hours of stored energy, which is about 10% of the necessary energy to make the trip across Australia, a total of 1900 miles. All other energy must come from the sun, or the kinetic energy generated from the motion of the vehicle. 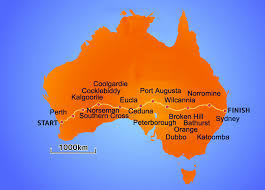 Every two years the race starts in Darwin, Northern Territory in Australia and ends in Adelaide, South Australia. According to worldsolarchallenge.org, “Once the teams have left Darwin they must travel as far as they can until 5pm in the afternoon, where they make camp in the desert wherever they happen to be. All teams must be fully self-sufficient and for all concerned it is a great adventure – many say the adventure of a lifetime!” During the journey there are 7 mandatory check points where team managers may update themselves with the latest information on the weather and their own position in the field and perform the most basic of maintenance only, checking and maintenance of tire pressure and cleaning of debris from the vehicle. Building cars for our future! 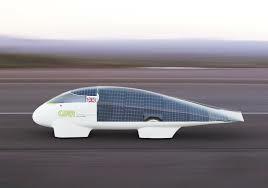 There are 3 categories of solar cars. The Challenger class makes the trip in a single stage from Darwin to Adelaide. The Cruiser Class is conducted as a regularity trial and the Adventure Class is a non-competitive class which consists of cars built for previous events. The World Solar Challenge contest is primarily designed to find the world’s most efficient solar car and to inspire some of the brightest young people on the planet to address the imperatives of sustainable transport! 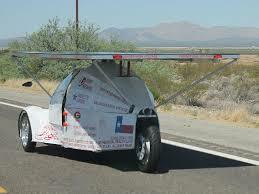 You can find the entry forms online on the Solar Challenge website. A chance of a lifetime! 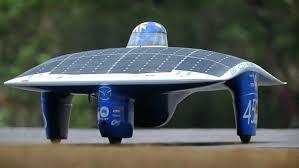 Entry in the solar car race. Categories: Building Green, Electric and hybrid vehicles, Renewable Resources, Solar, Sustainable Education | Tags: #Hanstholstrup, #solarcar, #theworldsolarchallenge | Permalink.